Clear IAS Launches Mains High Value Answer Writing Test Series for FREE! If you are confused what to do after your Prelims, you may read our the article ‘Prelims over! What next‘. Irrespective of your chances of clearing Prelims, all aspirants are advised to wet their feet in the waters of UPSC Mains Exam Preparation for the next 3 months. UPSC Civil Services Mains examination is an entirely different platform when compared to Prelims. Mains is a written test and the platform is bigger when compared to Prelims. There is a detailed syllabus, and there are nine papers in the exam. Papers for which marks are counted for final ranking include 1 essay paper, 4 general studies papers and 2 optional papers. There are also 2 other papers which are only qualifying in nature. Being one level above Prelims, to clear IAS mains, one require different strategies than those adopted for Prelims. But most aspirants, including those who score really high in Prelims are unsure about how to prepare for mains. Proper answer writing practice, good understanding of the latest UPSC syllabus and familiarity of current topics are important prerequisites of clearing IAS mains in flying colors. It is with this aim of equipping aspirants with the latest requirements of UPSC mains exam that we are launching today, Clear IAS Mains High Value Answer Writing Test Series. Take the best out of it! 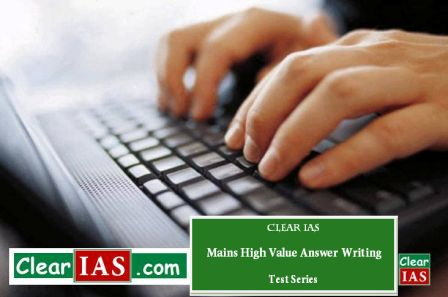 Clear IAS Mains High Value Answer Writing Test Series is completely free. Team ClearIAS.com, successful candidates in previous mains as well as fellow aspirants who take part in the Answer Writing Practice may comment/suggest corrections to your answers. Every one who comment in this platform are asked to use constructive criticism and refrain from using abusive language. In case, if you wish to participate at a bigger level by contributing articles to www.clearias.com as a guest contributor, check ‘Write Articles – Win Prizes! Contest‘. Though both programs help to polish your writing skills, Clear IAS Mains High Value Answer Writing Test Series is question-focused while the ‘Write Articles – Win Prizes! Contest’ is topic-focused. We wish to post regularly at 8 pm evening every day. If we are not getting enough response from serious candidates, we may drop the Clear IAS Mains High Value Answer Writing Test Series without any advance notice. Though we wish to do, but as we don’t have enough resources to give feedback in all languages permitted by UPSC (around 23), the official feedback from ClearIAS Team would be in English. However aspirants are free to write in this program in any language they choose for the UPSC main exam. You might get feedback from fellow aspirants/veternans/toppers. Participate in the Mains Answer Writing Test Series on a regular basis by commenting. You may benefit from valuable inputs from the comments and feedbacks of other serious participants. Knowledge sharing greatly helps in mains and interview preparation. The motive behind this initiative – Clear IAS Mains High Value Answer Writing Test Series – is to provide proper guidance for serious UPSC civil services aspirants regarding the requirements of mains exam. Clear IAS Mains High Value Answer Writing Test Series will be designed in such a way as to cover almost all relevant topics for UPSC mains within the next few months. All the best! PS : Check the first day questions of Clear IAS Mains High Value Answer Writing Test Series by following the hyperlink. Is one suppose to participate in this test without any preparation…. Developing writing skills, presenting the same, receiving feedback and improving progressively is the best practise. So utilising ClearIAS forum to submit it has as “Guest Article” is good platform to showcase everyone’s skill.